This is the 2nd post for today! Don’t miss the Saturday Sketch below!! Well it has been MONTHS since I have been able to participate in the monthly Dirty Challenge! I could not pass this one by. Challenge Focus: Create a NO LAYER card any size, any color. 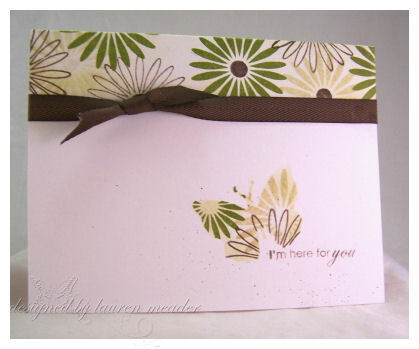 Your card base is it – no additional layers of cardstock or designer paper at all. Restricted Element: No use of the color pink (any shade) – I can’t believe I just typed that – it might kill me. I love that little sentiment. Its like a punny way to say “Hey look! I amde this! !” I adore Garden of Life. It is one of my faves, and SO underused. Pair it with another HUGE fave-Borders & Corners Circles and I am in heaven! I LOVE circles, and thought that masking for this would be great for the challenge, and I think I was right. I just punched a circle from some sticky paper, and stamped the flower in black. 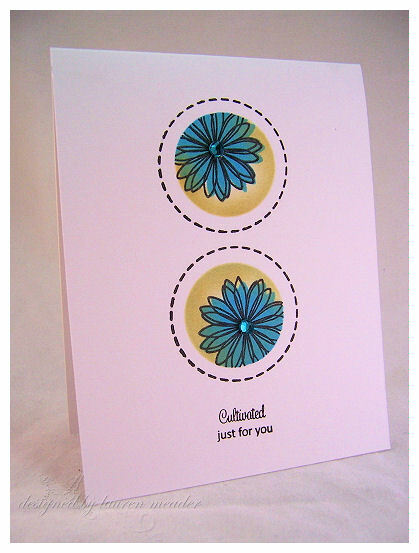 I then stamped the solid flower to layer in the outline. I then sponged in the open part of the circle! This is a super card for a quickie! This took LESS than 3 minutes! I kid you not! Make sure you check out the other girls challenge cards by searching the keyword above! Happy Saturday!! My favorite day of the week by far. I hope you have some stamping time planned this week. As you know it is Sketch Time! I am really happy with this weeks challenge! I know I had a blast with it. Sorry for my “sketch”. Im not good at making a scallop border-yet! YIKES! Again the sketch is to get you STAMPING! Go with whatever inspires you-OK! Keyword mytimess06-send us a link here if you decide to give it a try so we can all see your take on the challenge! It is definitely fun for me to see what people do with it. Now I will share my take on it. I decided to make my entire card a scallop. 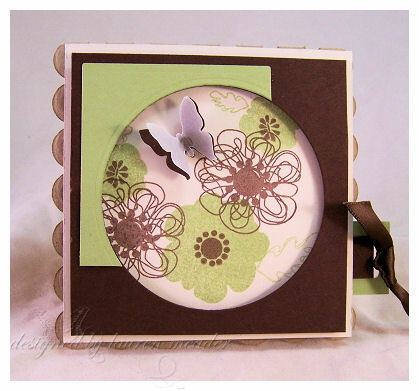 Im loving Vintage Cream, Kraft, spring moss, and dark chocolate-YUM!! I chose those colors with the inks to match for this creation. I used Lisa’s set Remember. I just love the open, and solid images paired together. I can’t NOT use them. 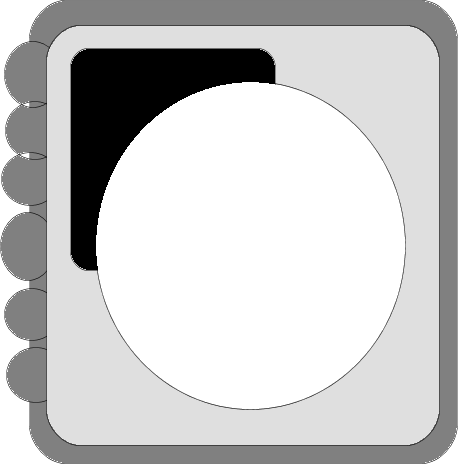 I saw this circle layer as a window, not an “layer”. I want you to use it in a way YOU see it though. Doesn’t have to be like mine OK! You know I LOVE my Martha Stewart butterfly punch, so I HAD to use that too, making a vellumbutterfly:D Just perfect isn’t it? I love dimension. For more interest I added a tasb tag, and tied on some satin chocolate ribbon. This inside is left blank, until I know what I need it for. This looks like a great ANY occasion card, so its nice to keep those around for when you need a quick card, but have no time. Granted I SAY this, but I never do it! I always have to MAKE a new one. Its a weird hang up I have. At least I use my stamps though right?! I have more to share tomorrow-so see you then!